Enjoy pictures from the 5th Annual InterGenerational Youth mini-Conference at the Wellspring. We drank from our collective wisdom, young and old, and celebrated a collaboration of Wellbeing hosted by the Ubuntu and Y-Elders teams. 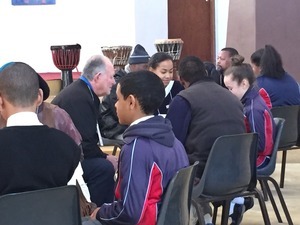 Together with Novalis staff and youth from Grassy Park and Pelikan Park, this was a splendid experience wherein everyone felt renewed and refreshed by the positive stream of new discoveries mostly hidden from plain sight. This celebration marks the mid-point of Ubuntu events 2017 which started with the Human Rights Day in Feburary together with a book launch by Hazel Carey, and will culminate in the third final event celebrating Heritage Day on the 27th September. Celebrating Women’s Day this year has changed to hosting a group of Voluntourists visiting the Cape and sharing their gifts on 9th August with caregivers and children at St Francis Home in Athlone. During the morning, we will be exploring and sharing with the group, our long South African journey towards democracy and freedom. This replaces the DAWN event this year. Also during August, Novalis collaborates with the Gnostic Festival, as well as supports UN Women and SAWID Dialogue on the 10th August on Reclaiming African Women’s Dignity as a Human Right : In Memory of the 1956 Women’s March. From the 19th – 27th August, we engage and support an International Conference entitled Evolve 2017. Anne-Lise Bure, Managing Director of Novalis will be sharing the platform with many other thought leaders and pioneers on various planetary core sustainable topics. See Evolve Flyer below. The 2ndHand Market continues to be a thriving and fair exchange.